Car and motorbike traffic on the narrow streets of Rio’s favelas creates a safety hazard for cyclists and pedestrians. Photo by EMBARQ Brasil. Hosting major events such as the World Cup or the Olympic Games can serve as a catalyst for cities to carry out infrastructure upgrades and urban renewal projects. Back in 1992, Barcelona set the example by using the infrastructure investments for the Summer Olympics — to plan not only for the event, but for how these areas would be used long after the games. As a result, the city was able to redevelop its waterfront and revitalize entire neighborhoods. Though the Barcelona example is often cited by cities planning for major events, its lessons are not always followed; Beijing’s famous Bird’s Nest Olympic Stadium is currently under-utilized. Rio de Janeiro, which will host both the World Cup and the Summer Olympics over the next three years, has taken a dynamic approach by using the infrastructure investments made for these events to also address some of its major, ongoing infrastructure, environmental, and social issues. For instance, the city is planning a major overhaul of its public transportation network, adding 150 kilometers (93 miles) of bus rapid transit (BRT) lines and extending a Metro line to connect major Olympic sites with the downtown area and the international airport. During the Olympics, the new BRT lines will address crucial transport needs between major Olympic sites; but even after the events, these new transit routes will amount to key improvements along some of the main commuting routes in Rio, considerably reducing travel times for millions of Cariocas. Another one of Rio’s flagship projects is Morar Carioca — a major initiative to improve accessibility, health, education, and the environment in the city’s informal neighborhoods, known as favelas. Favelas are most commonly built on hills or suburbs and consist of one to two-story brick houses, along narrow, and often unpaved, alleys and streets with considerable cars and motorcycle traffic — corridors sometimes lacking basic infrastructure such as electricity and sewage. While estimates of the number of favelas in Rio can vary considerably — due at least in part to the fact that some favelas have grown into larger complexes — most sources place their number at around 1,000, and the number of inhabitants at close to 1 million, or roughly a fifth of the city’s population. Traditionally, policies related to favelas have focused mostly on combatting crime, though recently, the city has also focused more on improving quality of life and providing better infrastructure. Through the Morar Carioca project, Rio has pledged 8 billion Brazilian reais (~$USD3.76 billion) to upgrading favelas across the city, and some of the results — building on previous favela improvements — are already visible. An architectural competition was held in 2011, allowing Brazilian architects to offer different visions for how favelas could be turned into healthier, more sustainable communities. The city has added public spaces, including public open-air gyms and soccer fields aimed at improving physical activity and health. It has paved streets and conducted vaccination and public health awareness campaigns. It has also improved garbage collection and sanitation and built landmark projects such as the Pavão elevator, connecting the top of a hilly favela directly to a Metro station. But there is still a need to better integrate considerations for transport, accessibility, and safety into the Morar Carioca program. In 2011, EMBARQ Brazil commissioned the first ever household travel survey in several of Rio’s favelas, revealing the travel patterns of favela residents and helping better understand their needs. As most favelas are relatively small in size, 90% of trips within them are made on foot. But for trips outside the favelas, residents rely mostly on public transit for 70% of their trips. The remaining problem, however, is that while most favelas are within walking or biking distance of a major transit station, walking or biking that short distance can be extremely difficult and dangerous. Major thoroughfares in Rio de Janeiro are extremely wide, often upwards of 100 meters (300 feet), and speed limits are commonly as high as 80 km/h (50 mph). Rio’s cycling infrastructure is mainly designed for recreational use rather than transportation. Pedestrian infrastructure is also poor, especially further away from the downtown. It is not uncommon to have intersections where some approaches lack a pedestrian crossing or protected pedestrian spaces, making it nearly impossible to cross them on foot. Vehicle ownership, overall, is low in the favelas, as can be expected in any low-income community. 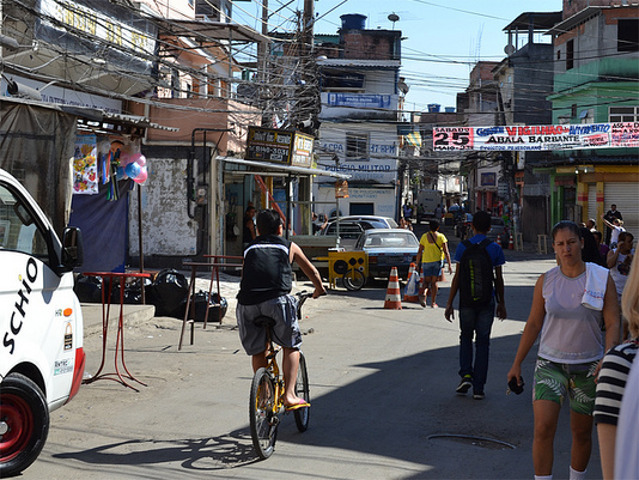 The survey results indicate that bicycles are the most common vehicles owned by favela residents. Of the survey respondents, 17% reported owning a bicycle, while 11.8% owned a car, and 5.8% owned a motorcycle. Despite the higher rates of bicycle ownership, favela residents rarely use them for traveling to destinations outside their community. In addition to the generally unsafe road environment that cyclists would have to cope with, another major hurdle to cycling is the lack of bike-parking facilities, especially at bus stations. While some of the newer Metro and BRT stations offer bike parking, favela residents rely largely on public buses when using public transit. Previous favela upgrading initiatives in Rio have focused exclusively on making improvements within these neighborhoods. In the case of Morar Carioca, on the other hand, one of the keys to the program’s success lies in thinking at a larger scale and in finding better ways to connect the favelas to the city’s rapid transit system. Finding the right solutions, in terms of infrastructure design, is relatively straightforward. The key challenge lies in implementing them, as this will require extensive inter-agency coordination. The Morar Carioca program is currently managed by the city of Rio’s Housing Secretariat. Improving cycling and pedestrian infrastructure on routes connecting favelas to major transit stations will require input from and coordination with the Secretariat of the Environment, which oversees bike routes in the city; the Secretariat of Transport, which oversees street infrastructure and signage; and potentially the different agencies in charge of conventional buses, the BRT, Metro, and Supervia commuter rail system to install bike-parking facilities at stations. Overcoming these challenges is the key for ensuring that Rio can build a lasting Olympic legacy which can serve as a model for future host cities.